The clock is ticking on the auction of Jose Bautista's bat-flip ball and its consignor is anxious to see where it winds up. Bidding on the ball from Bautista's three-run homer in Toronto's wild 6-3 victory over the Texas Rangers in Game 5 of the 2015 American League Division Series closes late on Friday. The price has risen from the reserve bid of US$3,500 on Jan. 4 to over $14,000 four weeks later. The anonymous Canadian consignor wants the ball to stay north of the border, but he has a plan to have it help baseball fans in this country if it doesn't. "When it gets to that high-dollar amount, I hope there's somebody in Canada that sees the importance of it being here," said the spokesperson for the small group that owns the ball. "We made the decision to take some of the money and make a donation to Robbie Alomar's foundation. We want to keep the ball safe here and if not, we're going to give some money to them and let them do what they do. "But I hope a big business or a big CEO steps up and buys it and puts it on display for the fans. That's what we really want. We want it to come back here and let the fans see it." Open bidding closes at 10 p.m. EST. Anyone who has bid on the ball before that deadline is then entitled to re-bid in a 30-minute window. If there are no bids in that window then the auction is closed but if someone does increase their bid, the overtime is extended by another 30 minutes to allow the other bidders a chance to raise their number. 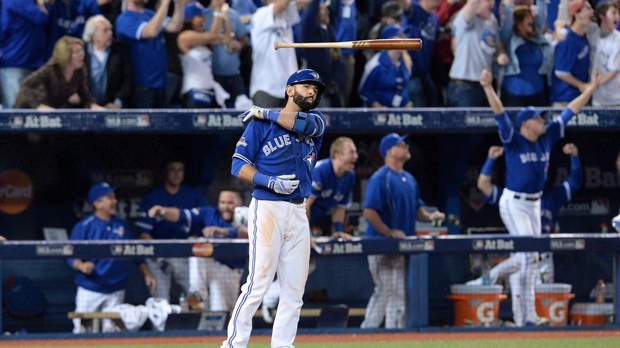 Bautista's seventh-inning home run won the ALDS for Toronto and became entrenched in Blue Jays lore when it was punctuated by his notorious bat flip. The now famous bat is kept in a glass case in Toronto's clubhouse in a foyer between the manager's office and the players' locker-room. The bat was on display for fans to see at the Blue Jays WinterFest that was held Jan. 19 and 20 at Rogers Centre, but the ball's location remained private until it went up for auction on Jan. 4. Alomar's Foundation 12 helps youth baseball players in Canada with financial assistance, program support, and educational opportunities. Alomar, who was the second baseman for Toronto's World Series championship teams in 1992 and 1993, is the only player to wear a Blue Jays cap into the Baseball Hall of Fame in Cooperstown, N.Y.
"(Foundation 12) does some amazing work with young people in baseball, special needs people," said the consignor. "Robbie was the greatest Blue Jay of all time, he's a Hall of Famer, he's a wonderful guy, we know him a little bit just from being at different events. "They do some amazing work."